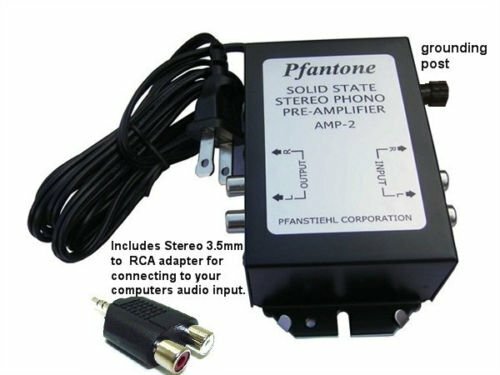 If you have a newer stereo receiver it most likely does not have a "PHONO" input. If you try plugging your turntable into any other of your receiver's audio inputs like AUX, CD, DVD etc., you will only get a faint audio signal. This item will solve your problem. Simply connect your turntables audio output leads to this preamps input, then from the preamps output to any available audio input on your receiver. This preamp will amplify your turntables audio signal to that of a CD, DVD, MP3 players output (line level). A convenient twist on/off grounding lug is provided on the input side for your turntables ground wire. It is also a great solution for converting your records to CDs by connecting preamps output straight into your PCs soundcard without the need for any other type of receiver or amp in between. A 3.5mm to stereo RCA adapter is included for connecting to your computer. If you have any questions about this product by Pfantone, contact us by completing and submitting the form below. If you are looking for a specif part number, please include it with your message.